Rory Gallagher's name was mentioned in routinely in the same breath as guitar heroes like Eric Clapton, Jeff Beck and Jimmy Page 25 years ago. They all took their inspirations from the blues and had backgrounds which seemed similarly inappropriate for careers based on a black American art form. But while the boys from the Home Countries developed their celebrity by switching to other styles, Gallagher, from Ballyshannon, Co. Donegal, stayed much the same. He was never to wrestle with the dilemma of whether it was time to switch from Armani to Versace, never to wonder if the Princess of Wales would come backstage. Gallagher, who has died of pneumonia at 47 a few weeks after a liver transplant, was cut from a different cloth-denim. A typical show with Taste, the trio he led in the sixties and with which he made his name, would start with Gallagher in jeans, lumberjack shirt, long dark hair almost masking his face, stamping a baseball-booted foot. His old Fender Stratocaster would be screaming under his fingers, nearly all the sunburst paint chipped off after years of gigging. He got his start in Cork with an outfit called The Impact, firmly in the Irish showband tradition, which meant everyone wearing the same outfit and covers of the hits of the say. Gallagher's job was to perform the Chuck Berry role. Next, in 1965, came a rock band which evolved into Taste with Richard McCracken on bass and John Wilson on drums. Gallagher was the creative force of the local heroes building their reputation with small gigs around Ireland. Their first album, with the same name as the band, majored on his extended blues work-outs and tortured vocals. But the next record, On the Boards, was the band's biggest success and showed how his songwriting had progressed. One of Taste's finest hours came at the Albert Hall in 1968, when they were chosen to share the bill for the final performance of Cream, the supergroup containing the combustible talents of Clapton, Ginger Baker and Jack Bruce. Taste also broke up acrimoniously after the 1970 Isle of Wight festival, with Gallagher claiming the other two were being greedy and Wilson saying he was being held back. He was rarely heard of again. By then, Gallagher was a star, with Van Morrison the only other genuine article Ireland had to offer before Thin Lizzy and long before The Boomtown Rats and U2. Bono, U2's lead singer described him as one of the top 10 guitarists of all time. "More importantly, he was one of the top 10 good guys." Gallagher received messages from Morrison, Bob Dylan and the folk guitarist, Martin Carthy, after his operation. John Lennon was an admirer in the sixties. Slash of Guns 'n' Roses in the nineties and Gallagher recorded with heroes Muddy Waters, Jerry Lee Lewis and Lonnie Donnegan. He forced Clapton to second place in Melody Maker reader polls. Gallagher had always been an outstanding live act and his 1972 album, Live in Europe made the top 10, and broadened his audience. Gallagher was a shy and modest man whose love of the blues was matched only by his interest in the movies. "There wasn't a movie made that Rory hadn't seen, " said a friend. " He could talk knowingly for hours about all sort of films." He released more than 20 albums, and sold more than 14 million copies of them, and though his popularity waned in Britain in the eighties, he was still a big star in much of Europe and Japan. He had been touring until he became ill last Christmas and had plans for a new album. But the devotion of his followers was tested when he played one of his last London shows two and a half years ago. The Town and Country in north London was sold out and the crowd was chanting "Rory, Rory." No one was unduly concerned when the support act reappeared for two more songs. Eventually, Gallagher took the stage, lurched past his microphone and started playing in a storm of feedback. Then it was immediately apparent that all was not well with Gallagher's rapid fingers failing him, notes being missed and misbent. The crowd's affection turned to anger and a shower of beer glasses and cries of "We're over here, Rory. " Gallagher stopped the band and said: " If you want Madonna , go and see Madonna. 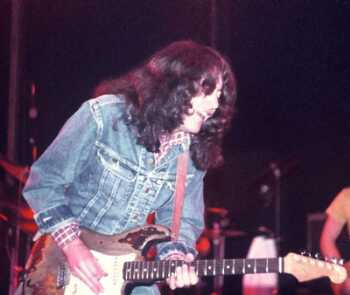 If you want the Thompson Twins, go and see the Thompson Twins, this is Rory Gallagher music." Things went from bad to worse, and everyone hoped that he would not attempt his mid set acoustic solo. He did. Gallagher fished a slide out of his pocket, dropped it on the stage and set about failing to tune the guitar to the open chord he was seeking. Members of the band gradually crept back on stage to give his meanderings some form. Gallagher stopped again and said: " Look, if you don't like it , you can go to the box office and get your money back. This is the last time I play London." Gallagher said in 1971: "The only extravagant thing I want is a farm in Ireland. I don't want a Rolls Royce." At the time he was 22, and living in an Earl's Court bedsitter. He ended up a few miles away in Fulham. "I want to walk out on stage at 40 or 50, and have people watching me like Muddy Waters." Only half of his wish came true. John Wainwright wrote to Donal after the ill fated show at the Town and Country. Here is Donal's reply in a 1992 letter. Many thanks for your letter. I am so sorry that the T&C concert was distressing for you due to Rory's condition. Unfortunately, he had medicated himself with tablets prescribed by his doctor, but mistakenly drank on an empty stomach which caused him his sickness and to appear to be completely intoxicated. He did, however, go on to play a terrific shown in Leeds the following night and we are planning a free show at the T&C to try and compensate for the London show. Gerry McAvoy, Brendan O'Neill and Rory part company over a year ago (though they played out some dates that were already committed) as they wished to form their own band "Nine below Zero". We are hoping to have an information service in operation by the start of '93 and will forward you details to the relevant person. Meantime, many thanks for your support and continued interest. Thanks to John Wainwright for passing along the article and the letter.